after the battle they made peace and lived together. the God of Gods and the Empress of the Demons fell in love. after months the Empress, Ahri, knew that she was pregnant and after those beautiful days another war happened. Ahri ran to earth an gave birth to most powerful and mischievous creature, Nine-Tailed Fox. And the story just Began. There were nothing, Before mankind and even before time itself. Nothing more than Gods and Demons. They lived, they ruled, they loved each other, they fought each other, at last they killed each other. The battle was so fierce that made nothingness blow up, from that battle everything shaped. From that energy, life started to shape. From elements to stars and from stars to planets. life was just conquering the nothingness. In the seventh day, the first creature shaped and started to evolve on a planet called "Earth". From fish to reptiles and from reptiles to dinosaurs .as Gods and Demons were watching, they learned the secrets of this so called "life". After millions of years they wanted to have their own garden with their own creatures. They extinguished dinosaurs and shaped a creature called mammals. As mammals evolved, they got smaller and smarter. It was just like the Gods and Demons were looking at themselves. As time passed, their garden was getting full of Mystery, full of Life. Mankind was the most and best evolved creature they made. Demons watched this and wanted to have the same power as Gods but it didn't matter how hard they tried, they just couldn't make peace between themselves. Gods were the real reason of life and they didn't want to join hands with their rancor. As this happened, mankind just ignored the Demons and started to shape hatred toward Demons. Another war was about to began. In the meantime the most powerful Demon whom was a woman fell in love with the king of Gods as their love was growing and she was going to give a birth to a child soon, a war started to shape. The Demon Queen, Ahri, felt cheated and her agony turned to pure hatred and darkness. She summand the strongest Demons and sucked their life energy out of their body and transferred their energy to her child in her belly. Ahri knew it wasn't just a simple battle it was just a kill-or-get-killed war. Ahri went to Earth as fast as possible and gave birth to the strongest Demon which had ever existed. The Demon baby wasn't normal at all, it was a fox-like creature and had nine tails. his color was like fire and as bright as the sun and his eyes were shining just like the energy of life. 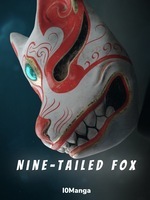 He had a black line from his nose to the tip of his nine tails which made him a little scary. His paws was black and had shades of red in it. His abnormal look wasn't ugly at all and made Ahri more relieved when she saw her fox-baby. The war has been started and the sky turned red and yellow from their clashes. A drop of tear came down on Ahri's cheek as she looked at the sky and imagined what might be happening there. She became furious and full of anger and turned her head and looked at the smiling fox. "you are Kario, you are the strongest if strongest, the smartest of smartest, you are the hope of us. Stronger than the gods. You are my Kario. Be better than us and after you got your full power, get back the empire i made for you. You are not what they think." Sighed in relief and closed her eyes. A strong dark energy came out of her belly and shaped a dark sphere and went into Kario. Shouted in pain, Ahri died after that transferring of energy . The energy changed the fox-shape body of the baby and turned him to a normal baby. But his eyes was still shining red brightly and the black line on his back was now even darker but thiner and it didn't disappear after turning into a human. A quiet village was nearby and there was a little house at the gate of the village. An old couple were living in there and they worked on a farm they had. From earliest hour of morning to the darkest hour of night. They didn't have a child and they were really poor to think about adopting one. the woman, Lili, cut some vegetables from their farm to go back and have lunch with her husband, she witnessed everything from the birth of the Demon to the baby which shape-shifted to a human. She was just hiding behind a tree and after the shout of Ahri, Lili came out of curiosity and looked at the baby and the Demon. Ahri was the most beautiful Demon and had a pair of dark-red horns on her head, she was wearing a black dress which covered her curves and showed her skin shamelessly. Even though her dress was ripped apart and blood was everywhere on it, it was still magnificent and could take breath of any mortal creature. Her body was as slim as ice and had a cold tune. Lili scared and jumped out of her place and noticed a baby with a black line on his back. As she knew his name, she called "Kario?" Kario laughed. It looked like he knew Lili. Lili couldn't resist and picked the baby. Lili was crying out of happiness on the road to there house with the little baby in her arm.